Photo contributed by John Gunn. Observed at Spur Cross Ranch Conservation Area, Maricopa Co., Arizona, USA. 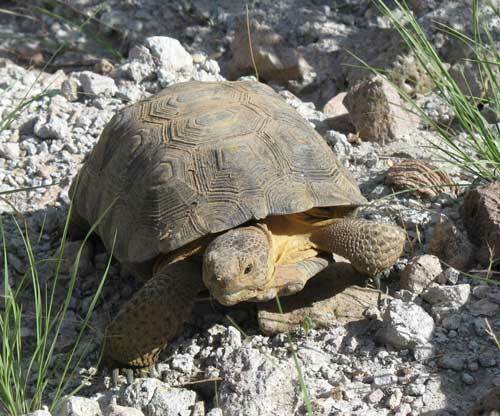 This iconic reptile of the Sonoran and Mojave Deserts is almost exclusively vegetarian. Active during seasons when fresh vegetation is to be had mostly at dawn and dusk. For the remainder of the day and when there is no food they remain in deep burrows. Gopher Tortoise are excellent diggers using their long, powerfully armored front legs to excavate. Unlike their cousins turtles, tortoises do not enter streams or ponds. Sprawling urban zones are the biggest threat to this Jurassic lineage animal. Their habitat paved over, getting struck by vehicles or harassed by feral dogs are just some of the threats these spreading human populations bring.